Next, we travel to the beautiful, rugged and remote Hebrides Islands. 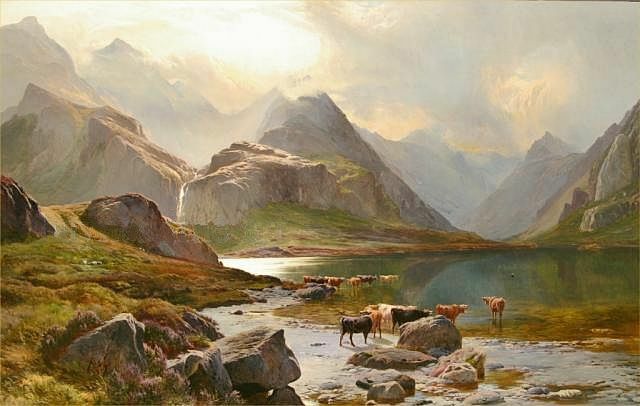 Located off the western coast of Scotland, the Hebrides are made up of two island chains – the Inner Hebrides, which include 35 inhabited islands and 44 uninhabited islands, and the Outer Hebrides, sometimes called the Western Isles, which include 15 inhabited islands as well as more than 50 uninhabited islands and islets. The two groups are separated by the waters of the Minch, Little Minch and the Sea of the Hebrides. 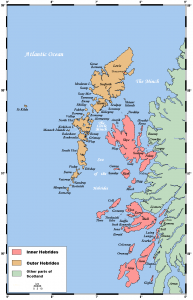 Scottish Gaelic is the main language in many of the islands, especially in the Outer Hebrides. The islands have a long history and archeological evidence dates occupation on the Isle of Islay back to 10,800 BC. Celtic, Norse and English occupations have formed the rich culture of these islands. 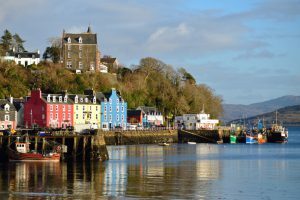 Many significant contributions to Gaelic literature and music can be tied to these islands, not to mention the excellent contribution of whisky from the famed distilleries of Skye, Islay and Jura. A traditional form of small scale food production called ‘crofting’ is a major occupation for many of the islands’ residents. A ‘croft’ is an enclosed plot of land which usually includes a dwelling, that is tended to by an individual in many cases. Plots that are more difficult to farm or graze, are managed by small communities or townships. In many cases, crofting is not sufficient to make a living and many crofters have additional occupations. Although surrounded by seas that are often stormy and rough, the Hebrides enjoy a surprisingly mild year round climate for their northerly location. Winters are rarely cold and it almost never snows. Summers are pleasant and there are only about two hours of darkness at night in midsummer. The Inner Hebrides are lie close to the coast of Western Scotland and are comprised of two groups. 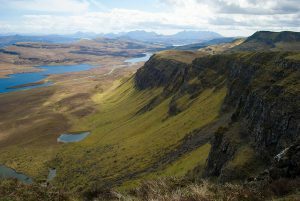 The northern group includes Skye and the four small isles of Canna, Eigg, Muck and Rhum. The southern group includes Mull, Iona, Islay, Lismore, Jura, Tiree, Coll Colonsay and some smaller islands. 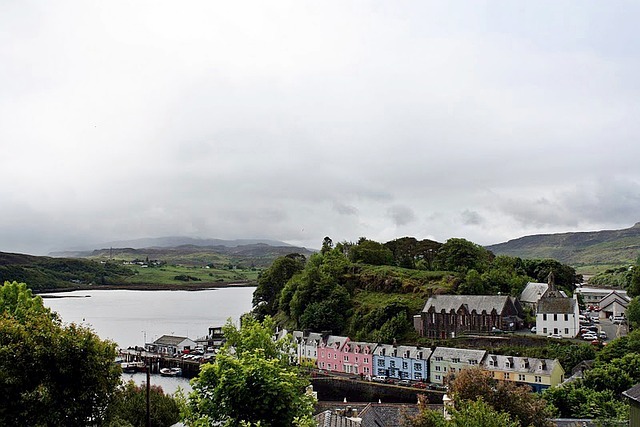 Skye is probably the most well known of these islands due to its incredible mountainous scenery, its famous whiskeys and the fact that it is connected to the mainland by a bridge and is more easily accessible. The islands are all scenic, some mountainous and some nearly flat. The small uninhabited island of Staffa is the location of the famous Fingal’s Cave, immortalized by German composer Felix Mendelssohn in his ‘Fingal’s Cave Overture’, Scottish poet James Macpherson in his Ossian cycle of Scottish Gaelic poems and mentioned by Jules Verne, William Wordsworth, John Keats and Alfred, Lord Tennyson. The Isle of Jura was home to author George Orwell, who spent the last four years of his life in a remote farmhouse on the north end of the island. It was on Jura, that he wrote his famous novel ‘1984’. The Outer Hebrides form their own parliamentary constituency. The main islands are Lewis and Harris, which technically, are one island. By far the most populated of the Outer Hebrides, Lewis and Harris is the location of the Callanish Standing Stones which are older than Stonehenge by about 2,000 years. Lewis, in the north, is relatively flat and is the location of Stornoway, the largest city in the Outer Hebrides. Lewis separates from Harris at a point where two Lochs cut into the island from the east and west. Harris is mountainous and rugged in comparison to Lewis. It is famed for Harris tweed fabric. 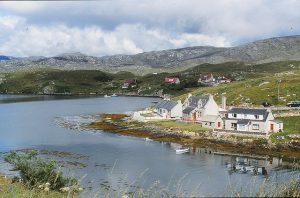 South Harris is connected by bridge to the small island of Scalpay. 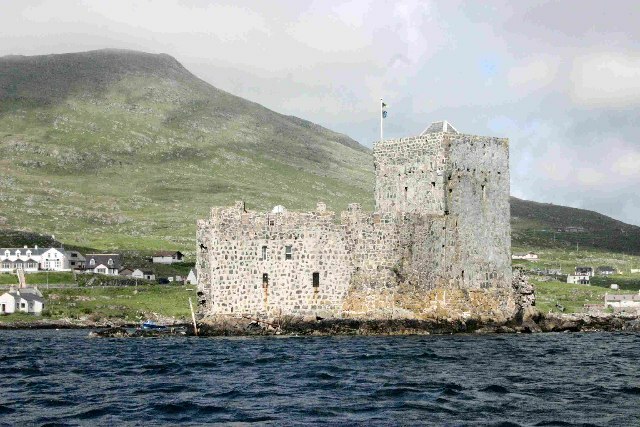 Other islands include South Uist, North Uist, Benbecula and Berneray, which was where Prince Charles went to become a crofter for a week in 1987. Wanting to learn about the practice of crofting, Prince Charles spent his time on the island planting potatoes, cutting peat, dipping (washing) sheep, and planting trees. St. Kilda is a small group of islands 40 miles farther west in the Atlantic which are also considered a part of the Outer Hebrides and fall into the parliamentary jurisdiction. Boasting the highest sea cliffs in the UK, the main island is Hirta, the only populated island. The other islands are Dùn, Soay and Boreray. Like the rest of the Hebrides, these islands contain plenty of ancient ruins although the population is thought to have never exceeded 180. 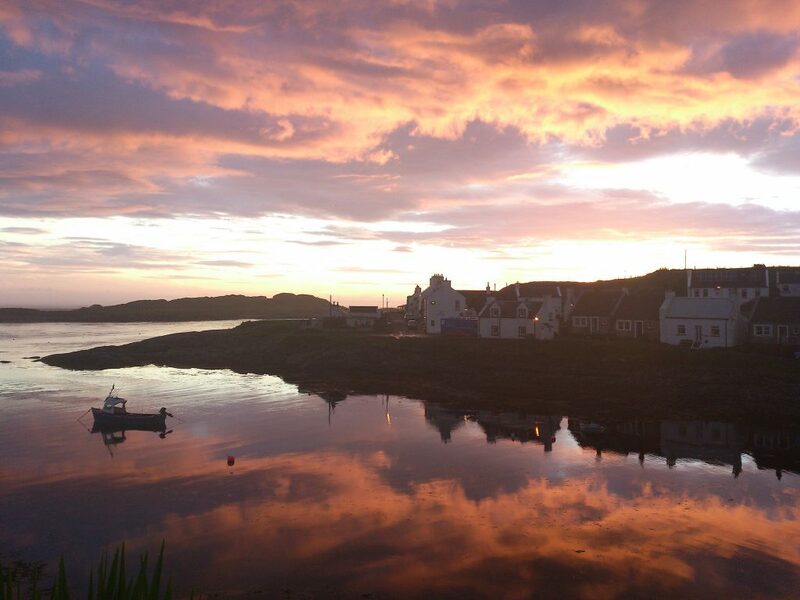 The Hebrides promise to be a very exciting island destination. We look forward to exploring the history, sights and culture of these stunning islands in the next few weeks.